Dear Amtrak; Customer service is on the wrong track. You goofed. You made a mistake, and the resolution was far from satisfactory. In fact, it stunk. We found another way around, but it meant solving the trouble ourselves by… well, let’s start at the beginning. We made reservations as a disabled person traveling with companion, and we asked for roomettes across from each other. The reservations were rooms 7 & 8. We checked in at the Denver station and confirmed our reservation: car number 632, roomettes 7 and 8. 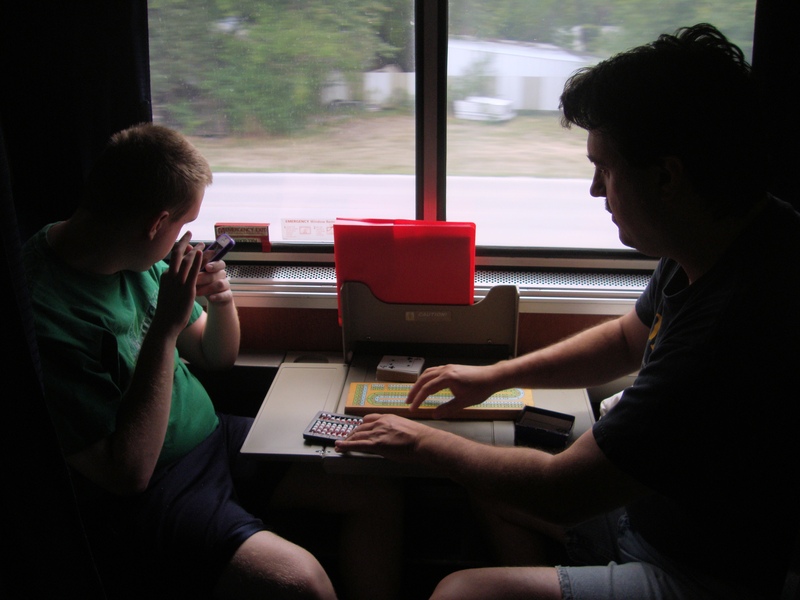 Amtrak, we reserved roomettes together to be near our son, who is blind and has Asperger’s Syndrome, a high-functioning disorder on the autism spectrum. If he needed help at any time, including at night, he could simply knock on our door (Hence the “companion” role). We dropped our gear in Amigo’s roomette, number 8, and went to supper. Chuck and I were very upset, and Amigo was beside himself with worry – so much so that he couldn’t eat. Chuck took Amigo back to the car early, and I settled up the bill. The car attendant and conductor had placed us at the end of the car in one of the larger bedroom units. Maybe they thought the upgrade would mollify us; it didn’t. We needed, really needed, to be near Amigo. The distance between our rooms was not acceptable. Not at all. We felt like bad parents accepting this poor alternative. We worried about his safety and his state of mind. Would he be able to find us if he needed help? He had his cell phone, but crossing the plains as the route did, phone signals were not guaranteed. Could he find the bathroom on his own? If you’ve ever been on a sleeper car, you know how much alike the corridor appears to a sighted person. Now try it blind. Chuck bumped into the current resident of room 7 and got his courage up to ask the man if he would be willing to trade rooms for the night. He explained the situation, and the man (grudgingly) said yes. We switched, moving all of our gear to 7 and helping him migrate to the larger bedroom at the end of the hall. We informed the car attendant that we’d traded spaces, and all of us began to settle down for the night. the dining car kept running out of food. ice water in the car was empty, and bottled water unavailable. Chuck had to change over our beds in the morning; the car attendant didn’t. We requested a newspaper; Chuck found one for us, since the car attendant didn’t do this, either. I couldn’t access the wifi on board. I gave up. By this time, making an effort was beyond my limits. All of these smaller irritations might have been easier to handle had we not been overwhelmed by the room problem. Amtrak, what happened? How will you make sure no other family encounters the same problems we did? This entry was posted in family life; vacation plans and tagged disabilities by Daisy. Bookmark the permalink. This is interesting. I used to love riding the rails and have taken a handful of loooong trips. I had always been quite pleased until 2 years ago when I took the train out East. The filth, the lack of any sort of service, the lack of drinking water and very limited food supply made me not want to try again. I am so sorry your trip had to include this sort of rooming problem. I wrote a formal letter of complaint about my trip and 2 months later I received a call from a ‘customer service’ rep. I was not home so she left a message that basically said they were sorry and hoped I would travel with them again. It is very sad to me that such a great way to travel America has become one of the worst ways to travel. We recently took Amtrak to St. Louis and enjoyed it. While waiting in the train station, though, we heard lots of complaints from people taking longer trips. I think we’ll continue to take it for shorter trips, but don’t know if we’re brave enough to take it for longer trips.